Dan Brandenstein, chairman of the Astronaut Scholarship Foundation, will hold an announcement for the 2014 U. S. Astronaut Hall of Fame inductees at 1:30 p.m. on Friday, Feb. 7. The ceremony will be held at the Visitor Complex. The Astronaut Scholarship Foundation serves as a consultant for the Hall of Fame, which includes conducting the selection process of astronauts for enshrinement by an outside committee. The Astronaut Hall of Fame is part of the Visitor Complex and is included in regular guest admission. The U.S. Astronaut Hall of Fame induction ceremony is scheduled for May 3, 2014 with the Astronaut Scholarship Foundation's annual gala preceding the night before on May 2. A spacewalker who flew a record seven times into orbit and the first American woman to complete a long-duration space station mission will be inducted into the U.S. Astronaut of Hall of Fame, officials announced on Friday (Feb. 7). Former NASA astronauts Jerry Ross and Shannon Lucid were revealed as the Hall of Fame's 2014 honorees during a ceremony held Friday at NASA's Kennedy Space Center Visitor Complex in Florida. Ross and Lucid will be formally enshrined into the Hall on May 3 during a public induction to include many of the institution's 85 astronaut members. "[Lucid and Ross] are extraordinary astronauts who made history as important and frequent crewmembers on shuttle missions," Dan Brandenstein, a four-time shuttle flier and 2003 Astronaut Hall of Fame inductee, remarked. "We are looking forward to honoring their accomplishments and to sharing their tremendous life stories." 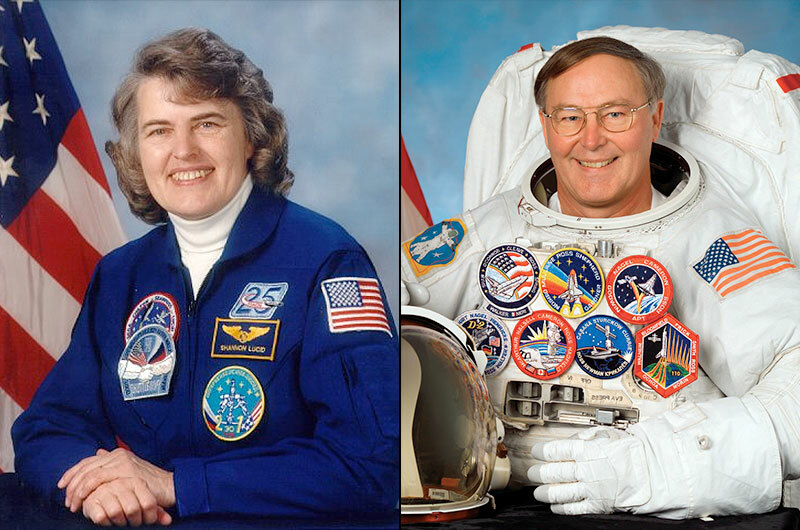 We're excited to help welcome Shannon Lucid and Jerry Ross into the Astronaut Hall of Fame, and are looking forward to honoring them at Astronaut Scholarship Foundation's 2014 U.S. Astronaut Hall of Fame Induction Gala. More information and tickets are available on our website. We hope you'll join us for the celebration! We're looking forward to seeing those of you who'll be joining us at the induction gala on Friday night! However, we did want to remind those of you who are not attending the gala but may live in the area that the actual induction ceremony, held Saturday, May 3, occurs on the Kennedy Space Center Visitor Complex campus and is open to the public. This year the ceremony will be taking place in the park's Atlantis exhibit! Our Scholar Technical Conference has expanded this year, and will also be taking place on the campus on May 3 from 9 a.m. to 12:30 p.m. So if you're already visiting to see the ceremony, stop by! Astronaut Eileen Collins is our keynote speaker this year. Her speech, our Astronaut Scholars' lectures, and several other presentations will be happening in the Astronaut Encounter Theater, and we'll also have simulator demonstrations and a robotics exhibit in the Debus Conference Facility rotunda! All of this is at no extra cost after the purchase of a park ticket. Hope to see you there! Any reports from this year's AHOF Induction? The U.S. Astronaut of Hall of Fame added two new members to its ranks Saturday (May 3), during an induction ceremony that was the first to be held under the elevated display of NASA's retired space shuttle Atlantis. It was only a coincidence that the inductees had both set records while flying aboard that particular orbiter. Shannon Lucid and Jerry Ross were received into the U.S. Astronaut Hall of Fame by a group of more than 20 of their fellow honorees, including veterans of NASA's Apollo and shuttle programs. The ceremony was held at the Kennedy Space Center Visitor Complex in Florida, inside the Space Shuttle Atlantis exhibit that opened last June. I was only able to be there on Saturday this year, missing the gala. I hear it was a good time though, for all those who attended. The ceremony's new venue, under space shuttle Atlantis, was really a great fit. The Hall has been honoring shuttle astronauts for 13 years now, but this was the first year where it really felt like the transition from Apollo and shuttle had taken hold. There were only a couple of Apollo veterans in attendance (Stafford, Mitchell) and a few with a connection to shuttle (Haise, Brand, Garriott), the rest were all shuttle veterans. John Blaha and Charlie Precourt did a great job welcoming Shannon Lucid and Jerry Ross into their ranks as Hall of Fame astronauts. Both Lucid and Ross were eloquent in their own remarks and were clearly enjoying the well-deserved honor. Before the ceremony began, I saw a few cS members, and was able to catch up Jay Barbree, Hugh Harris and Jack King, as well as the excellent public affairs and curatorial staff at the visitor complex. With Jerry Ross going in they had to have under Atlantis. They seem to always be together. It looked great on NASA TV. Always shocking to see how old some of the astronauts look when the walk to the stage. Then again I am now the age they were when they were flying.